WOW Look at this Beauty!! Take a look at this 2012 Mercedes Benz C63 AMG Coupe with a Clean Carfax, White with Black Leather Interior, 53k miles, AMG Exhaust, AMG Wheels, Glass Sunroof, Navigation, 4 Brand New Tires, Heated Seats, Paddle Shifters, Traction Control, Parking Distance Control, Memory Seating, Portable Audio Connection, Bluetooth, Premium Audio-Harman Kardan, Satellite Radio, Stereo Controls on the Wheel, Keyless Entry, Power Windows, Locks & Mirrors. A/C, Cruise, Tilt, CD. **Previous Canadian History** This vehicle may be subject to a Safety Recall, visit www.nhtsa.gov/recalls or www.SaferCar.gov ALL Vehicles come NYS Inspected and Select Vehicles Include Warranty! Buy with Confidence! EZ Access Off Ext 9 of I90! Trades Welcome - All Reasonable Offers Considered!!! We ship our vehicles worldwide, please call us for a shipping quote. WE OFFER GUARANTEED CREDIT PROGRAMS!!!! Call Toll FREE 866-440-3907 or TEXT anytime 518-844-4420!! FREE Carfax available on any vehicle! Call for your copy today! FINANCING for ALL needs! Rates From 2.74% APR if credit qualified! Great rates for the credit challenged too! AD CREATED BY AUTOMOTIVE ENHANCEMENT WWW.MICHAELSAUTOPLAZA.COM PHONE 518-689-0266 Information deemed reliable, but not guaranteed. Interested parties should confirm all data before relying on it to make a purchase decision. All prices and specifications are subject to change without notice. Prices may not include additional fees such as government fees and taxes, title and registration fees, finance charges, dealer document preparation fees, processing fees, and emission testing and compliance charges. 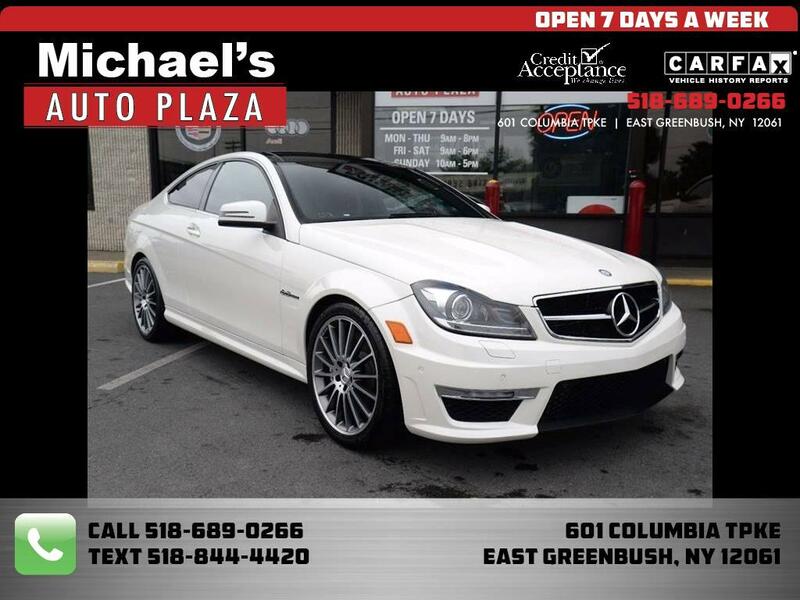 Visit Michael's Auto Plaza online at www.michaelsautoplaza.com to see more pictures of this vehicle or call us at 518-689-0266 today to schedule your test drive. Message: Thought you might be interested in this 2012 Mercedes-Benz C-Class.